Fusing is the technique of joining two or more pieces of glass by heat in a kiln. There are different glass fusing techniques. For example, “tack fusing” is a fusing technique in which the pieces of glass are heated until they are just hot enough to stick together and retain many of their own original characteristics. In a full fuse, on the other hand, glass is heated until it becomes molten. Fusing requires a special type of glass. Specifically, the different glasses you use must all be compatible with each other. We recommend using Bullseye kiln-glass for fusing projects because we test and label all of the glass we manufacture for compatibility. When using one or more different types of glass, you’ll need to perform your own tests for compatability. Many people use the terms “fusing” and “kilnforming” interchangeably; however, that is not entirely correct as fusing is one of many kilnforming methods. People also tend to use “kiln-glass” and “fused glass” interchangeably, though we prefer to reserve “fused glass” for finished projects that have already been fired in a kiln and fused with another piece of glass. Fused glass art can be any number of things: from slumped bowls and platters, to printed imagery, to anything else the mind can conceive and make. 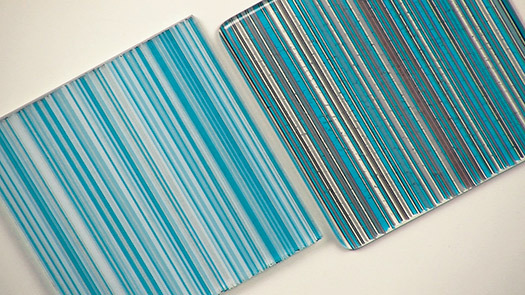 At Bullseye, we manufacture a variety of kiln-glasses that can be used for fusing. This also includes accessory glasses like frit, powder, rod, and stringer. For more information on glass fusing and fused glass, be sure to watch our video lesson: Fusing Basics. Don't forget to browse fusible-grade Bullseye Glass at the Bullseye Online Store.